This bracket kit can eliminate up to 45 pounds of front end weight thereby improving front and rear weight transfer for better traction. Mounts between water pump and power steering pump. CNC-machined from 6061-T6 aluminum. All mounting hardware included. Will not work with 1994-95 Mustang, 1989-93 Thunderbird/Cougar, and 1996 Explorer timing covers. 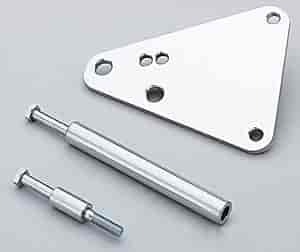 Adjustable alternator bracket kit allows adjustment of alternator position for tight spaces. These kits come complete with bracket, stainless steel adjusting rod, chrome moly rod end, and mounting hardware for serpentine or V-belt setup. CNC-machined from solid billet 6061-T6 aluminum to fit perfectly and handle high torque and vibration. This bracket kit comes complete with stainless steel tensioning rods and chrome moly rod ends for high performance operation. All necessary hardware included. Powdercoated to eliminate polishing in those hard to reach places. CNC-machined from 6061-T6 aluminum. Exceptionally styled alternator bracket fits v-belt applications. Comes complete with tensioning rod with chrome moly rod ends for perfect belt tension and all mounting hardware. Powdercoated to eliminate polishing. Does March Performance 1460 fit your vehicle? 1460 is rated 4.0 out of 5 by 1. Rated 4 out of 5 by Cashman again from Perfect fit Installed on a customers gt mustang that wanted no a/c & no p/s . This kit allowed me to use serpitine belt , new belt #s supplied (thank you) factory tensioner and all bolts , holes and spacers perfect fit. Directions very clear.i do recommend .